During the last thirty years or so it has been widely recognised in the research community that the key transmission medium seeming capable of serving both the ever-growing demand for bandwidth and the unceasing need for new services, is optical fibre. In this context, Wavelength Division Multiplexing (WDM) is the most popular technique for introducing concurrency among multiple user transmissions into the network and, thus, exploiting the huge amount of fibre bandwidth available under the severe limitations imposed by electronics speed on the maximum network access rate. This book extensively covers an important research area in optical networking, enabling readers to fully understand the concepts of optical LANs and learn details of architecture issues and control protocols. Through its careful focus on the local area, the book, covers the major architectural, topological and protocol issues regarding optical Local Area Networks (LANs) today. Considering that constant advances on optical component technology make all-optical WDM LANs all the more feasible for a wide commercial deployment, the book investigates thoroughly the crucial latter topic, i.e. the Media-Access Control (MAC) protocols that should be used. Besides introducing a noteworthy part of the vast literature on such protocols and providing some helpful distinguishing key protocol characteristics, the book is also innovative in focusing on a recent significant class of promising protocols whose operation is based on network feedback information. In this way, these adaptive protocols for optical LANs achieve an overall higher performance in comparison with many other non-adaptive schemes. No Optical systems/network developers, or engineers and scientists working in optical networking should be without this book. The well considered approach also makes this recommended reading for undergraduate and graduate computer science, computer, electrical and telecommunications engineering students. Georgios I. Papadimitriou is the author of Multiwavelength Optical LANs, published by Wiley. 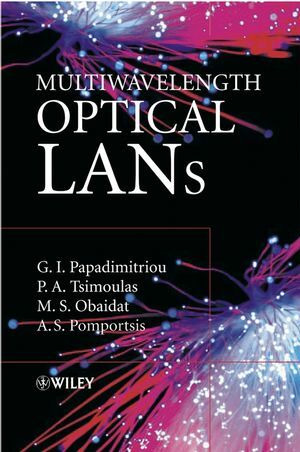 Paraskevas A. Tsimoulas is the author of Multiwavelength Optical LANs, published by Wiley. Advantages of Optical Fibre as a Transmission Medium. Evolution of Optical Networking?Major Technological Milestones. Second Generation Optical Networks?Main Classes. A Closer Look at WDM Broadcast-and-Select Local Area Networks. 3. Medium Access Control Protocols.